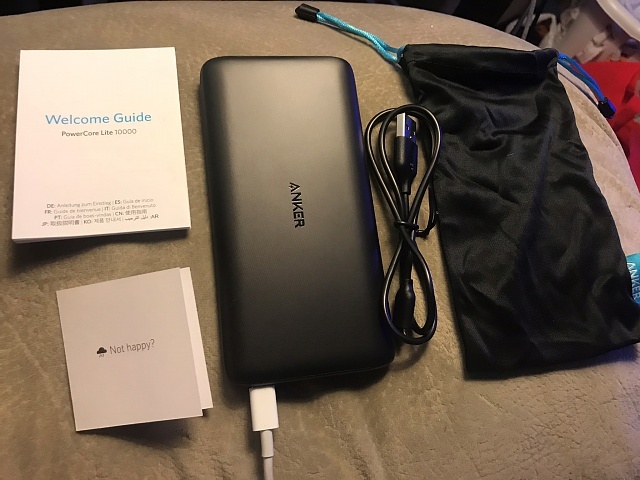 I recently purchased an Anker Power Core Lite. The battery came nicely packaged, and included the unit itself, a nice carrying bag, a micro USB cord, and documentation. The documentation included the product manual as well as a support card with Anker contact info. The unit itself is very slick looking and has curved sides. It's about the size of a phone, BUT it can charge your phone several times. While I did not do a "scientific" test, I DID charge my iPhone from 26% to 100% in less than an hour. And this did not even tick 1 off of the 4 dots on the power level indicator. While we are talking about the indicator which is on the side of the device, lets examine the device more closely. There is a button on the bottom which lets you check the power level as well as activate the power boost mode (I think) There is a USB A port for power output that can accept a micro USB, USB C (as long as it's not C to C, more on that in a sec), AND lightning cable. There are 2 input ports micro USB and USB C. There is NO USB C output nor a second (or 3rd) USB A port. I would have liked to see a second output either another A or a C.
That 1 issue aside I really like this unit. It feels great in the hand and charges devices very quickly. I was also able to recharge the battery itself very quickly. Again nothing scientific, BUT perceptually it charges very fast. Included pouch is very nice, BUT the included micro USB cord is basic and nothing special. Use your own cords! Bottomline: Solid purchase, fair price! Portable Power Brick for S8? Galaxy Tab Pro 10.1 - System updated - Now I can only receive email - can't send. Huawei p20 lite disconnecting when i click transfer files! !